After reading Lauren B. Resnick’s “Learning in school and out”, perhaps it is not surprising that the traditional answer to this question, posed daily by parents to their children, usually consists of “Nothing.” As Resnick (1987) writes about in-school learning transferring out-of-school, “Both the structure of the knowledge used and the social conditions of its use may be more fundamentally mismatched than previously thought” (p.15). I wouldn’t blame a child for failing to sum up a day of solitary work with abstract symbols or concepts. Before I continue, I’m not a pessimist and I believe there is plenty of good that happens in schools. I’ve seen it in my classroom and that of my peers. However, the entirety of one’s education cannot occur in school alone. It is the responsibility of parents and communities to help bridge the gaps between in-school and out-of-school learning. As a parent, my wife and I try to make everything a learning opportunity. This does not mean lecturing or droning on about how much the adults know, but rather sparking curiosity. Drop the occasional, “I wonder…?” or “Can you believe…?” and then let the child take the bait or not. 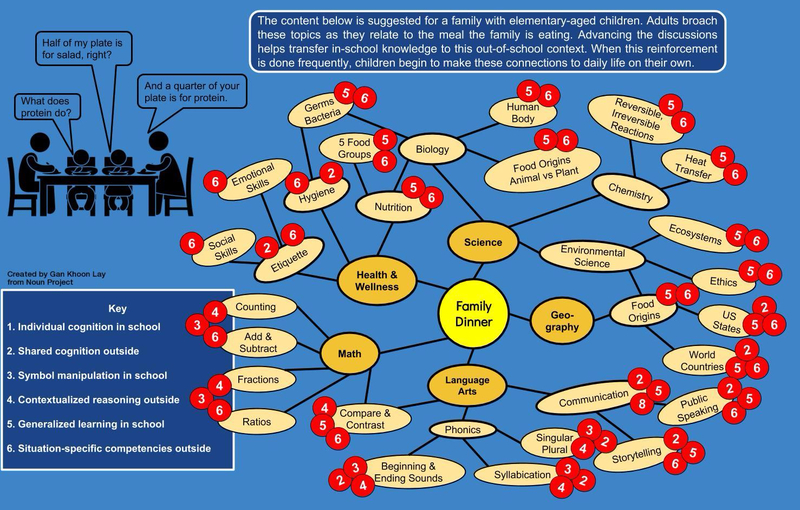 Below is a representation of an out-of-school learning scenario displaying the many ways an ordinary activity, in this case eating dinner as a family, can lend itself to making important connections overlapping with in-school knowledge. Here are a few self-reminders I use as a parent and teacher to keep making the effort to bridge in- and out-of-school learning. First, don’t underestimate the amount of initial learning one must have to achieve transfer in a subject (Bransford et al., 2000, p. 53). This initial knowledge must be more than memorized facts or bits of knowledge. There must be an understanding, like a complete picture, explaining how and why before transfer can happen (Bransford et al., 2000, p. 55). Second, don’t underestimate the amount of time necessary to acquire this initial learning and understanding. This understanding can not be crammed. Time is needed for the “development of pattern recognition skills that support the fluent identification of meaningful patterns of information” (Bransford et al., 2000, p. 56). Without these higher levels of understanding and organization, students are less likely to integrate new information. Given the ample time and effort necessary for understanding, it may not be possible to accomplish this progress solely during school, and learning must continue at home and in the surrounding community. This leads to the third self-reminder; there are major differences between in-school and out-of-school learning (Resnick, 1987). None of these different modes of learning are necessarily better or worse than the others, but they serve to further divide the content learned in school from practical application outside and vice versa. Efforts should be taken to cross implement in-school and out-of-school modes of learning in order to bridge this divide. Fourth, a universal motivator is relevance. As Bransford, Brown & Cocking (2000) write, “Learners of all ages are more motivated when they can see the usefulness of what they are learning” (p.61). One way for students to see something as useful, while at the same time increasing the chances of transfer, is to present knowledge in multiple contexts. Bransford et al. (2000) suggest multiple contexts, “what-if” changes to primary contexts, and abstract representations. Even while in school, content can be presented in as many hypothetical out-of-school contexts as possible in order to further bridge the gap between out-of-school and in-school learning. Bransford, J.D., Brown, A.L., and Cocking, R.R. (2000). How People Learn Brain, Mind, Experience, and School (Expanded Edition). Washington, D.C.: National Academy Press. Resnick, Lauren B. (1987). The 1987 Presidential Address: Learning in School and out. Educational Researcher, Vol. 16, No. 9. 13-20+54. 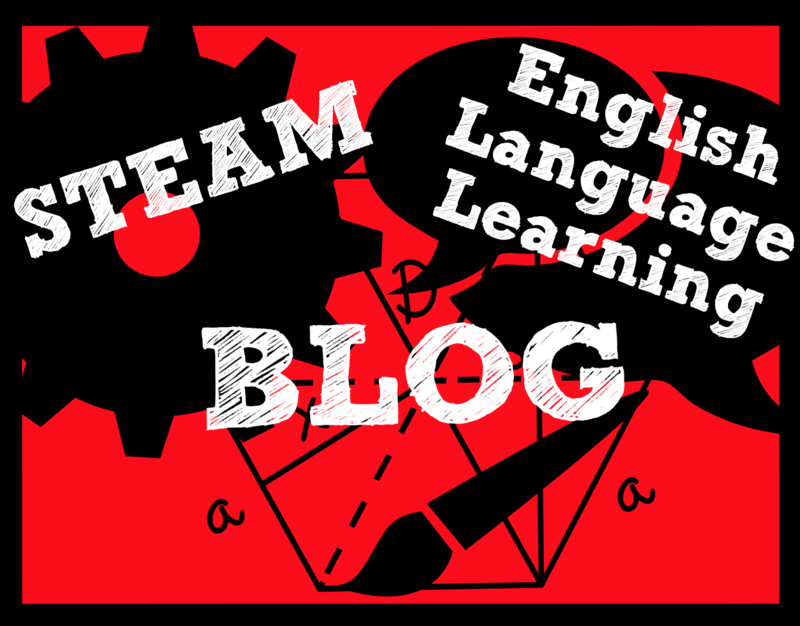 This entry was posted in Educational Technology. Bookmark the permalink.